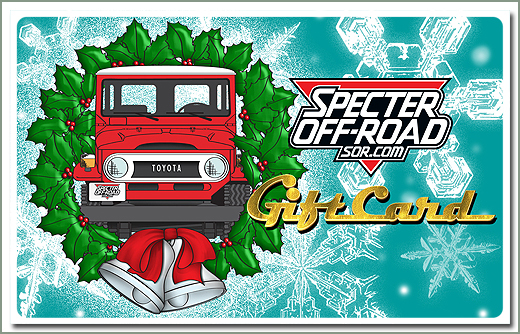 Give a SOR Giftcard! 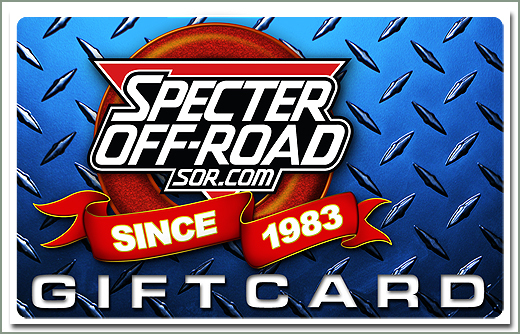 Specter Off-Road has even made gift giving easy, and you know you're buying something they'll really like. Giftcards can be redeemed online, over the phone or in person! Custom dollar amounts over $100 can be ordered over the phone. To redeem your Giftcard enter the number on the back of the card. There is no expiration date for the cards. The entire amount of the Giftcard will be subtracted from your order. Any credit left over will be applied to the type of Payment you provide. To redeem your Rebate Coupon enter the number on the back of the card. The entire amount of the Rebate Coupon will be subtracted from your order. Order must be greater than the Rebate Coupons combined.